Plans are in the pipeline for work to head off future flooding on the A1 dual carriageway. The news follows a series of recent closures or partial closures on the A1 locally as flood waters stemmed traffic flow on one of Northern Ireland’s main arterial routes. Most recently, the carriageway was partially shut overnight from last Wednesday to Thursday.The Department of Regional Development said at the time the southbound carriageway had experienced flooding and would be closed between Banbridge and Dromore with a contraflow system in place. Notwithstanding the severity of Storm Frank, the closures gave rise to concerns over the impact on so important a route. Among those to speak out after the most recent closure was Lagan Valley MP Jeffrey Donaldson, who has since reported that a priority scheme is in the offing . “I spoke to the Regional Development Minister Michelle McIlveen about it,” he said, “because obviously this was maybe the third time the A1 had been closed due to flooding. 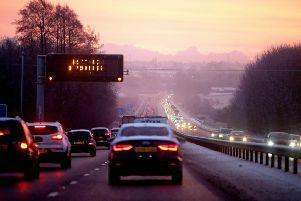 “With the terrible weather conditions we have been experiencing, a number of roads have been closed, but the A1 is one of the major commuter routes in Northern Ireland as well as the main road between Belfast and Dublin. “I have spoken with the minister about this problem and she assures me Transport NI (formerly Roads Service) has now identified the cause of the flooding and her department is prioritising a scheme to resolve this issue. Mr Donaldson said work could not be progressed during ongoing heavy rainfall. To any suggestion that works might fall at a funding hurdle, Mr Donaldson said it was essential funding be made available given the importance of the A1.